Watching the Hahnenkamm Races live is quick and simple. Seldom has a major sporting event been so easily and comfortably accessible. 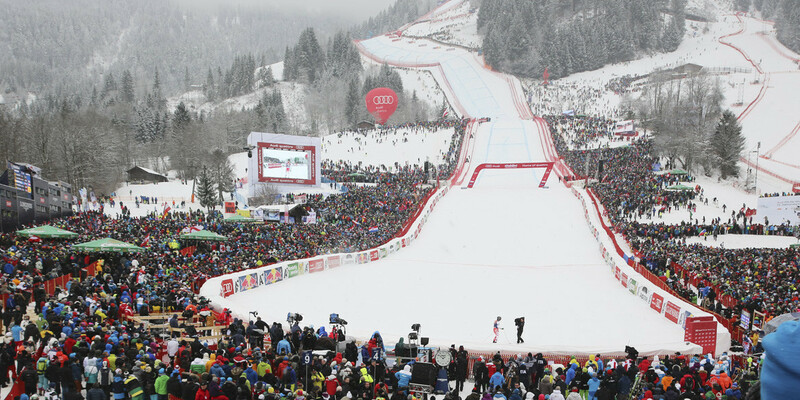 The free shuttle trains transport spectators to the Hahnenkamm station, which is only 5 minutes' walk away from the event location. Tickets allowing acess to the general viewing areas can be bought at all entrances. Last minute visitors are also welcome, as there is an unlimited contingent of tickets to these areas. The VIP zone is always located next to the finishing area. There are a limited number of tickets (standing room) for this zone. A few are still available for Super-G-Friday (90 €) and Slalom Sunday (110 €). Tickets for seats in the VIP stands are also very limited and amount to 170 € or 210 € apiece for the Super-G (20.01) or Slalom (22.01) respectively ... while stocks last. Reserved tickets will be available for collection in the Aquarena (indoor pool). Click here for the order form. Open from 10 hrs to 17 hrs as of from Monday (16.01). Open from 7:30 hrs to 17 hrs on race days (20.01-22.01).